We invite our industry friends to guest-bartend for a night alongside Sean Kenyon! They whip up a curated menu, and we donate the profits to the charity of our friend’s choice! Get it? Friends. Benefits. Austin is an Oklahoma native with Colorado roots. With two decades of experience in the Food and Beverage industry, he has become one of the most influential figures in the Denver beverage scene. In August of 2018 Austin and his business partners opened Bistro Georgette inside of Avanti Food and Beverage amid much fan fare. Prior to that he was the corporate wine director for Bonanno Concepts, and general manager of the fine dining institution Mizuna. Nick Touch was born and raised in Des Moines, and learned to tend bar at Atlas World Grill while attending the University of Iowa. He moved to Denver, CO in 2005. 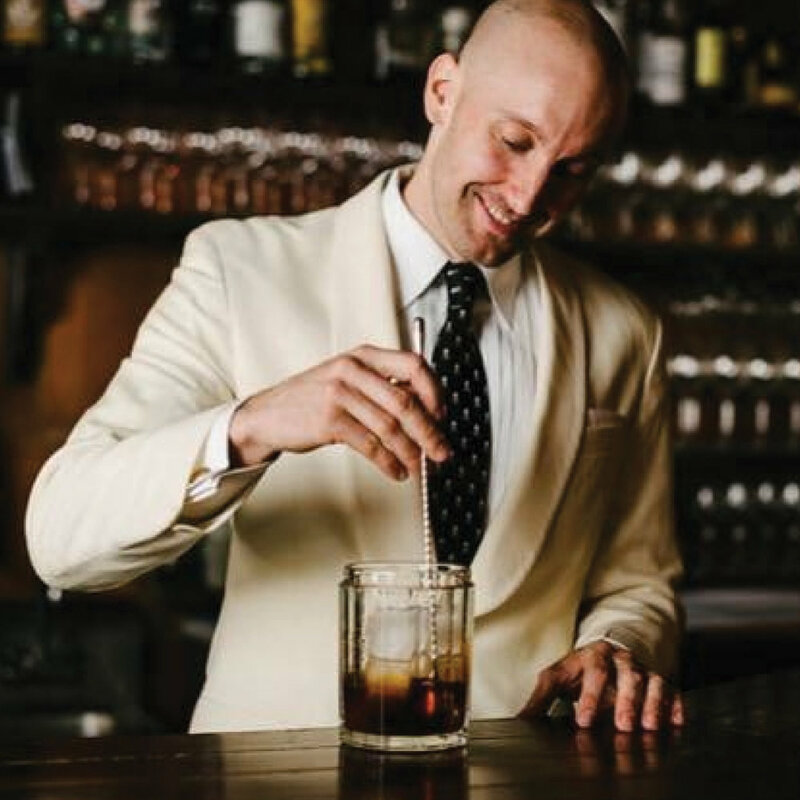 Nick has spent the last 12 years in the Hospitality and Spirits Marketing Industry, working in several cocktail bars, neighborhood bars, nightclubs, and restaurants. Nick was part of the opening team at Williams and Graham, where he tended bar for 5 years, during which time Williams and Graham was named “Best American Cocktail Bar” at Tales of the Cocktail, as well as being in the Drinks International “Top 50 Bars in the World”. He passed the prestigious B.A.R. 5-day course in 2012. Nick has also worked as a Brand Ambassador with the SF based Marketing Company, The Bon Vivants. Clients included, Tequila Ocho, Ancho Reyes, and Luxardo. Nick Joined The Family Jones in 2017, initially taking the role of Bar Manager, and transitioning into his current role as a Brand Specialist where he focuses on Sales and Marketing, while maintaining a creative role within the company. Nick spent 3 years in the Vail valley but quickly moved back to Denver after meeting his Wife, Shauna. Together with Shauna, Nick loves to play in the mountains, cook, travel, and hang with family and friends while enjoying great food and drink, and loves spending time with their four legged & "kid”, Sophie. Inspired by every aspect of the Spirit and Hospitality Industries, Brittany is a self-motivated industry professional with over ten years of hospitality experience in a spirit driven environment. Her drive and career path are rooted in integrity, quality, and passion and she bases her success on that of those around her. She has been fortunate enough to participate in both local and regional professional bartending competitions and was recognized as one of Zagat Denver’s 30 under 30 in 2015. Alongside the professional growth gained from competing, Brittany has also worked hard in the pursuit of continuing education, participating in Bar Institute, Portland Cocktail Week, Camp Runamok, and Bar Smarts Live, as well as 4 USBG Regional Conferences. As the Vice President of the Colorado Bartender’s Guild, it is her goal to help other industry professionals in their pursuit of education and excellence as well as support Denver’s thriving community. Brittany has worked with and learned from some of the best people in city at Z Cuisine, Green Russell, Tag, Baur’s, The Way Back, and B&GC, where she was also working as Denver’s St-Germain Ambassador. She recently stepped out from behind the bar in 2017 to pursue a full-time position as a Portfolio Specialist for Beam Suntory. It is with great humility and honor that she joins Sean Kenyon’s, ‘Friend’s with Benefits,’ and she can’t wait to get back behind the bar again, especially to be a part of such a special vision of what true “service” means. The charity that she has chosen to work with is called, The Harm Reduction Action Center, who has committed itself to serving Colorado’s public health by working to reduce the harms associated with drug use. Since 2002, our organization has provided direct services that curb the spread of HIV, Hepatitis C, and accidental overdoses among people who inject drugs. To bolster their direct service efforts, the Harm Reduction Action Center also works closely with lawmakers, healthcare providers, law enforcement, and the general community towards a common vision of a healthy and safe Colorado.